For years, ownCloud has supported ‘Federation‘. The concept behind Federation is to allow users to have shared files and folders even when using different servers. ownCloud aims to enable super easy, global file sharing and collaboration with the 8 million ownCloud users across the globe without the need for a single, centralized server. Ideally this is done in a way so that the user doesn’t even notice if another person is using the same server or a server on the other side of the world. 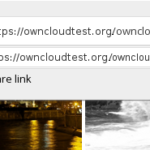 With ownCloud 8.2 it is possible to send a sharing request to a user on a different server and have a shared file or folder. 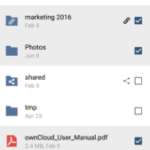 This works very well and is a very popular feature among ownCloud users. With ownCloud 9.0 we push this concept even further and close the last few missing gaps of this vision of making the interaction between users on different servers completely seamless. A limitation of the federated sharing of ownCloud 8.2 is that you have to know the Federated Cloud Sharing ID (kind of an email address for file sharing) of another user to be able to send a sharing request. It would make the experience of sharing completely smooth if there was automatic user name completion in the sharing dialog even for users on different servers, so that a user only has to type in a name to be able to select a user on a different server. This is what ownCloud 9.0 makes possible! ownCloud 9.0 introduces the concept of trusted servers. Trusted servers exchange user information so that users on other servers can be easily found and selected. The list of trusted server can be maintained manually by the server admins or can grow automatically and intelligently based on user shares. Combined with significant performance improvements for Federated Cloud Sharing, keeping your data under your control while collaborating with people across the globe has never been easier. Besides the improvements between ownCloud servers, we have also worked on bringing seamless sharing to servers outside of the ownCloud ecosystem. The Federated Sharing API specification released last summer as a draft is now final. Thanks to the very open ownCloud development process we where able to get and incorporated a lot of feedback over the last few months. Work is ongoing with different standardization bodies to make this a industry standard specification. Several other cloud file sync and share software vendors and projects have expressed interest in implementing and supporting this specification. The very first to do so Pydio, which implemented the API already and which will achieve full compatibility with their next major release. Another important initiative in this regard is Open Cloud Mesh. This is a group of research institutions and universities under the umbrella of Geant that are committed to push the idea of Federated Cloud sharing forward and which support the Federated Cloud Sharing API. If you’re active in research or academics we suggest you check out this project to super-charge scientific collaboration world wide!